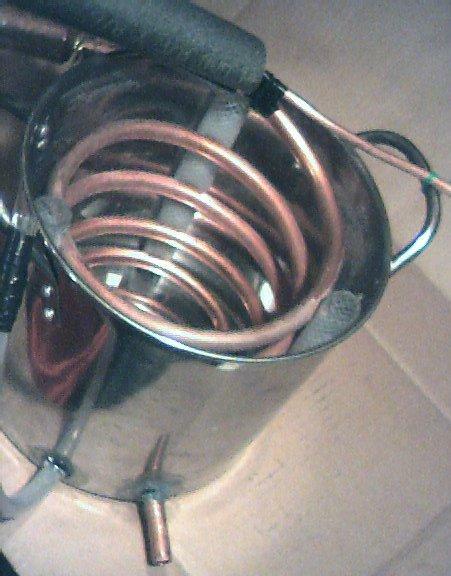 What about using a bucket of cold water and coils of copper tubing to condense the steam? This approach is basically building a simplistic water-cooled heat exchanger. The input reservoir can be a commonly available pressure cooker of any size. Alternatively the input reservoir can be made from any able to be closed container. Not much pressure is involved so theoretically it could even be made from a paint can in a pinch. I used a 4.2-quart aluminum pressure cooker that took about 15 min to start producing output once it is turned on from a cold start. Using the attached test set up shown at right, with coil detail below, I was able to produce about 6.5 cups/hour of distilled water. The input source was an electric stove 240 volt x 7.3 amps = 1750 watts. 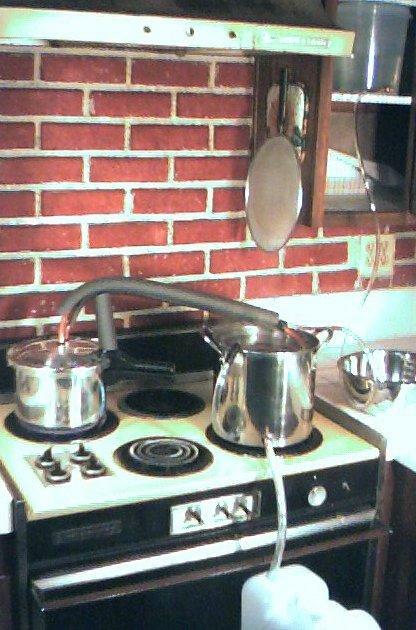 Note that water is replenished from the upper reservoir at the same rate it is turned to steam by adjusting the needle valve on the supply bucket and keeping track of the level by use of the site gauge (silicon rubber hose) on the side of the pressure cooker. I found the water in the heat exchanger bucket gets extremely hot (from top down) and needs completely changing approximately every 35 min. This is a messy process in that when the tank is drained the copper coils get extra hot and the output hose and rubber seals get very hot. For good tasting water it is not good do to this extra heat on vinyl or rubber parts and it also tends to introduce leaks in the bottom of the exchanger tank where the copper tubing makes its seal with the stainless steel bucket. After a couple of hours of running I didnt consider this design to be good enough for day-to-day production unit worthy of a primitive environment. One could defiantly not walk away from it and leave it unattended. It would take constant maintenance and attention. Also the resulting water had a strong vinyl taste to it. As a result, I dont recommend using vinyl on any output part of the distillation system. Along the same line, any hydrocarbons (oils) that are in the water before distillation will end up in the output having been evaporated and then condensed back into the output water. Thus taste will be a problem using this method because of the estimated large amount of hydrocarbons (oils) found in the after PS available water. Also the method of measuring the water level in the pressure cooker needed some redesigning. Silicon rubber fish tank air hose will soften and swell up and eventually split open or leak at the ends. I initially tried to use this for a water level indicator and rapidly found it was not practical. Vinyl is worse it will swell, turn white, stretch and becomes very soft so it is not very usable on the hot output side. Glass tubing would work but is not available or practical in a primitive environment.